As you know, I am trying to get back on the blogging bandwagon.. so I thought I would pick back up with my Recipe Wednesdays and this one you will love! I arrived home in NC yesterday to FREEZING cold weather!! This Florida girl seriously can't handle the cold. Since it is cold in Florida and all over the US.. I thought this recipe would be perfect. It is so fast to make and really delicious. I am not a big Chili fan (mainly because of those huge kidney beans found in most chili), but I love this recipe. We make it a couple times of month when the weather turns cold. My husband requested it last night.. so it is what we are having for dinner tonight. For those of you who started your New Years diet.. this is a healthy meal (if you omit the cheese). - In a large resealable bag, toss raw ground turkey with flour until it is absorbed into meat. - Heat oil in a wide 2 quart pot over medium heat. Add ground turkey and cook until browned, about 5 minutes. - Crush the tomatoes and add tomatoes and liquid to turkey. - Add beans, tomato paste and taco seasoning. 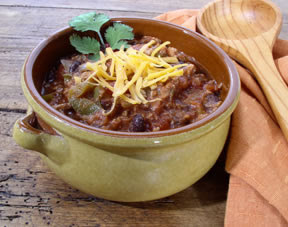 -Simmer over medium-low heat until chili is slightly thick, about 8 minutes. - Add 1-2 cups of shredded cheese until melted. Serve warm with a side of cornbread or corn chips. I love this food, but I never made something like this.